Unit fuel expense (per ASK) in Q3’16 fell by 33% compared to Q3’15. Unit non-fuel expenses (per ASK) increased by 11% in Q3’16 compared to Q3’15. Unit non-fuel expenses on the rise, increasing airline’s dependency on low fuel prices. Overall unit operational expenses (per ASK) fell by 9%. Cargo carried in Q3’16 lowest in current fiscal. Seat factors in Q3’16 lower than in Q1’16. Operational RASK in Q3’16 down 7% from Q3’15, and down 4% from Q1’16. Unit operational Profit (per ASK) down 5% compared to Q1’16, but up 2% compared to Q3’15. Aircraft utilization ups, average operational cost per flight INR 581,027. Forecast: Q4’16 unit fuel costs drop below INR 1.00 per ASK. Forecast: Q4’16 RASK to drop lower than in Q2’16. Most industry experts and analysts believe that the quarter ending December 31st (Q3) is better than the quarter ending June 30th (Q1). Between the summer and the winter of the same calendar year, an airline usually adds capacity, and this usually translates to larger revenues and diluted fixed costs, which leads to most referring to Q3 as the best quarter of the financial year ending March 31st. Q3 and Q1 are the better quarters of a year, referred to as the peak seasons for domestic travel demand. Comparing an airline’s revenue performance between two quarters of similar demand makes for a fair comparison. In the Q3 of financial year 2015-16 (Q3’16), IndiGo flew 8.3 million passengers, up 1.5% from the 8.2 million passengers in flew in Q1’16. Of the 8.3 million, only 5% were on international flights, reinforcing the fact that IndiGo’s business model focuses on domestic air connectivity. However, IndiGo had flown a total of 59,216 flights in Q3, up 4.8% from Q1’16. The 4.8% growth in the number of departures stemmed from a 2.6% increase in the airline’s fleet to a period average of 97.1 aircraft, and a 2% growth in the average aircraft utilisation, to close to 12:30hrs per aircraft per day. The 4.8% increase in the number of flights translates to the same growth in the number of seats offered, and yet, passenger numbers grew by only 1.5%. Average seat factors (a measure of per flight occupancy) fell by 3 percentage points (pp) to 78% from 81% in Q1’16. Inventory management in Q1’16 appears to be better. IndiGo’s profit from operations (excluding other income, finance costs, exceptional items, tax expenses, and extraordinary items) in Q3’16 was INR 857 crores, up only 0.2% from Q1’16’s profit from operations of INR 855 crores. We do not consider other income, finance costs, exceptional items, tax expenses, and extraordinary items, as these reflect neither the strengths nor weaknesses of an airline’s operations and commercial strategy. We shall examine IndiGo’s costs and revenues over 4 quarters: Q3’15, Q1’16, Q2’16 and Q3’16. Of these four quarters, only Q2’16 is a quarter of low domestic travel demand. Fuel is an airline’s single largest expense. In Q3 of the previous financial year (Q3’15, ending Dec 31st 2014), fuel accounted for 46% of IndiGo’s operational expenses. This decreased over the quarters to 40% in Q1’16, 36% in Q2’16, and 34% in Q3’16. Fuel prices in Q3’16 fell by 31% when compared to Q3’15. However, IndiGo’s fuel expense per available seat kilometer (ASK) fell by a larger 33% to INR 1.08 per ASK in Q3’16, perhaps on account of optimised tankering of fuel from cities with lower tax on aviation turbine fuel (ATF). The cost of aircraft and engine leases, including supplementary lease (also known as maintenance reserves, MR), has gradually increased over the quarters to INR 0.71 per ASK, from INR 0.65 per ASK. Other airlines, unlike IndiGo, account for maintenance reserves under maintenance charges. This increase may be explained by the induction of older Airbus A320s from airlines such as Tiger air, which had a fleet of stored airplanes after its Indonesian subsidiary shut operations. 11 such airplanes were inducted in 2015, out of the 17 older A320s that the airline presently has. It may be possible that the terms on which these airplanes have been secured are not as attractive as the other newer Airbus A320s in the airline’s fleet which formed a part of the original 100 aircraft order in the year 2005. It is however possible that the terms are acceptable to IndiGo, when weighed against the cost of opportunity. 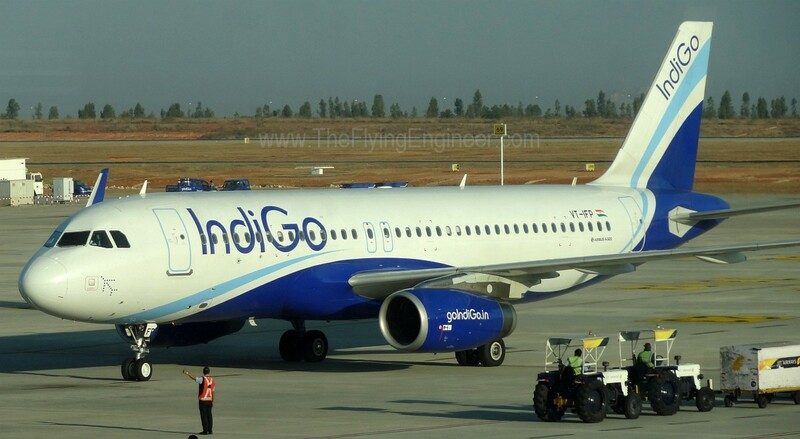 IndiGo was aware since a long time about possible issues with the Airbus A320neos, which is perhaps one of the reasons why the airline entered into short term (~3 year) leases for 22 older and used Airbus A320 aircraft. The other reason was the need to scale up capacity in the light of developments in the competitive landscape, including the birth of new airlines and the near death of SpiceJet. Such leases may also have an effect on the quantum of cash and non-cash incentives that the airline may have received for aircraft under operational leases. On a per ASK basis, cash and non-cash incentives for aircraft and engine leases has dropped by 18%. Higher rentals and lower overall incentives have driven up aircraft and engine lease rentals by 14% per ASK (including MR) in Q3’16 compared to Q3’15. Unit employee expenses have also been gradually increasing at IndiGo, to INR 0.43 per ASK, up 24% from the unit cost in Q3’15. IndiGo presently has around 1,600 pilots and 3000 cabin crew, which translates to approximately 800 sets of flight crew and 750 sets of cabin crew. An airline requires between 4 to 5 sets of flight and cabin crew for operations, per airplane. IndiGo has a fleet size of 101 airplanes, translating to the airline having 8 sets or pilots and cabin crew per aircraft, or an excess of 3 to 4 sets of crew per airplane. The excess 600 – 800 pilots and 1,000 – 1,400 cabin crew are to cater to the airline’s expansion. IndiGo may induct close to 30 airplanes in calendar year 2016. Manpower planning at IndiGo has always been farsighted. Employee stock options (ESOPs) cost IndiGo INR 23 crores in Q3’16. Depreciation and amortisation expenses have gone up 35% on a per ASK basis, due to changes in component accounting mandated by the new Companies Act 2013, which IndiGo adopted from the start of the present financial year. Hence, the depreciation and amortisation cost has been fairly constant over Q1’16, Q2’16 and Q3’16. Landing and enroute charges, which includes landing charges, route navigation facility, charges, terminal navigation landing charges, parking and housing charges, X-ray charges and CUTE charges at applicable airports has increased by 5% per ASK over Q3’15, due to higher charges levied by airport operators. 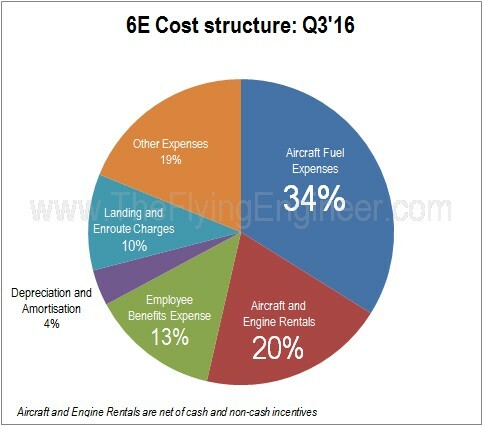 Other expenses, which includes operations related expenses such as purchase of goods, food and beverage for in-flight sales, selling and distribution expenses, maintenance expenses, insurance payments, training expenses, and others have slightly increased by around 1% compared to Q3’15. All non fuel expenses at IndiGo have increased, on a per ASK basis, while incentives have reduced. Overall, this may not reflect too well on the airline’s cost structure. A part of the increase in expenses, besides the reasons mentioned above, is due to the depreciation of the Indian rupee against the US dollar. Around 60% of an airline’s expenses are payable in the US currency. Non fuel expenses have increased by 11% in Q3’16 over Q3’15, and had been gradually increasing over the quarters. However, the falling fuel prices has resulted in an overall 9% drop in operating expenses on a per ASK basis. Based on the Q3’16 cost structure, which has the highest non-fuel expenses among the four quarters for IndiGo, an increase in fuel prices may put IndiGo in a spot of bother, in a lean season. Increased fuel prices will attempt to drive up fares, which will reduce demand. Overcapacity (with respect to real demand) will adversely impact the airline’s operational profitability. However, fuel prices, though volatile, may continue to stay low at least in the short term. Revenue from operations are driven by passenger ticket revenues and ancillary revenue. Other operational revenues are comprised of amortized incentives for aircraft on finance leases. Revenue from operations accounts for 99.5% of the total income from operations. Income from operations (which is 99.5% of the total income from operations) is largely driven by passenger ticket sales. In Q3’16, 88% of the income from operations was due to passenger ticket revenue. The remaining 12% was from ancillary revenue, up 1.5 pp from the 10.5% in Q3’15. 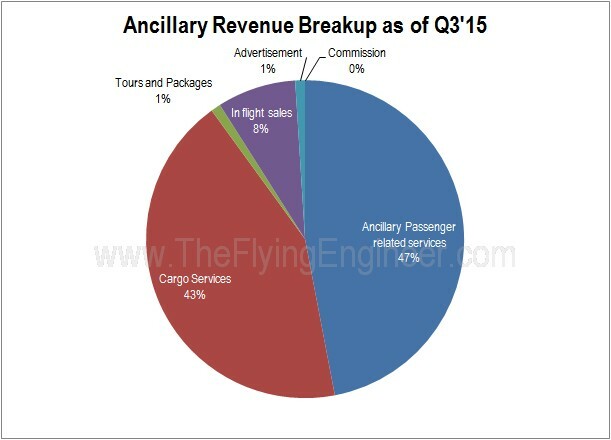 Ancillary revenue includes both revenues from ancillary passenger related services, and products and services that are ancillary to airline passenger services. Revenue from ancillary passenger related services includes including seat selection, charges for infants and assistance for unaccompanied minors, excess baggage and ticket modifications or cancellations including expiry of credit shell, excess baggage, lounge income and convenience fee. This accounts for nearly 50% of IndiGo’s ancillary revenue. The other 50% is from cargo services, in-flight sales, commissions from insurance sales, advertisement, and the tours and packages that are sold through IndiGo. In Q3’16, IndiGo carried on average 596kg of cargo per domestic flight, and 865kg of cargo per international flight. These values are 15% and 31% lower than the average cargo carried on domestic and international flights, respectively, in Q3’15. 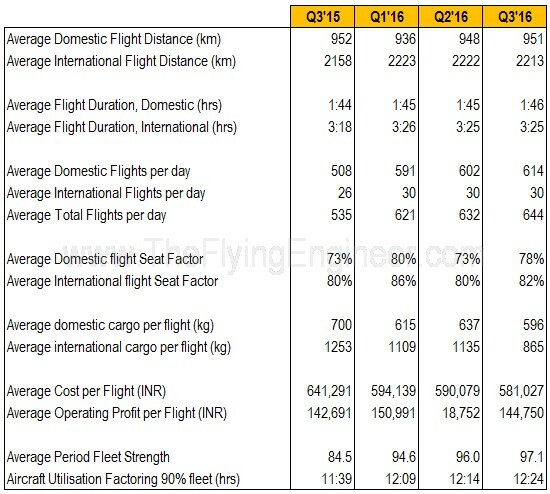 (Refer the table on operational figures) In Q3’15, cargo accounted for nearly 42%-47% of the airline’s total ancillary revenue, forming between 84% to 94% of the airline’s revenue from products and services ancillary to airline passenger services. In Q3’16, with the cargo carried per flight dropping by significant numbers, the revenue from cargo is estimated at only 33% of the airline’s total ancillary revenue. In Q3’16, revenue from operations dropped to INR 3.97 per ASK, down 7% from INR 4.29 in Q3’15, and down 4% from INR 4.12 in Q1’16. The drop in numbers were on account of lower seat factors, overall lowering of airfares across the industry due to the passing on of the benefits of lower fuel prices to passengers, and increased competition. IndiGo’s seat factors (percentage of an airplane’s seats occupied) in Q3’16 were higher than in Q3’15, but 2% and 5% lower than the seat factors for domestic and international flights, respectively, at the airline in Q1’16. (Refer the table on operational figures) Lower seat factors at similar ticket prices lowers revenue per ASK (RASK). Average ticket fares in Q3’16, at IndiGo (excluding taxes, fees and levies) was INR 4,517, down 14% from INR 5,262 in Q3’15. While the lowering of average fares is in line with both lowering fuel prices and increased competition, the fall in RASK, in part due to lower seat factors, may perhaps be attributed to the scope for better inventory management at IndiGo. Other operating income has remained fairly constant over the quarters. Total revenue from operations is comprised of revenue from domestic operations and international operations. As of Q3’16, 91.5% of the airline’s revenues stem from domestic operations, while only 8.5% is from international operations. 95% of the airline’s flights in Q3’15 were domestic, the rest 5% were international, a number that has remained constant over all four quarters under consideration. RASK from domestic stood at average of INR 4.07 per ASK in Q3’16, down 9% from INR 4.48 per ASK in Q3’15. International RASK, however, increased by 14% in Q3’16, to INR 3.35 per ASK, from INR 2.94 per ASK in Q3’15, showing significant improvement in unit revenues on the international front. Since the average international flight length at IndiGo is 2.3 times the average domestic flight, a direct comparison between the RASKs will be unfair. After normalising for the flight distance, the RASK in Q3’15 of international works out to around INR 4.47 per ASK, higher than that of the domestic’s RASK. This value is 15% higher than the adjusted RASK in Q3’15. In Q1’16, Q2’16 and Q3’16, adjusted RASK from international is higher than domestic RASK. In the lean season of Q2’16, IndiGo had a RASK of INR 3.36 per ASK. Interestingly, in Q2’16, IndiGo had the same seat factors as in Q3’15, for both domestic and international flights. However, the RASK was down 22%, clearly indicating low demand in the lean season which in turn significantly lowers unit revenues. Profit from operations in Q3’16 stood at INR 857 crores, up 22% from INR 702 crore in Q3’15, but up only 0.2% from INR 855 crore in Q1’16. On a unit basis, IndiGo made an operating profit of INR 0.80 per ASK in Q3’16, up 2% from INR 0.78 per ASK in Q3’15, but down 5% from INR 0.84 per ASK in Q1’16. IndiGo, which had domestic passenger load factors of 92% in Q1’16 in the month of May (in Q1’16), played very well with its inventory, making Q1’16 the best quarter (in terms of unit performance) in the entire fiscal 2015-16. The unit operational profit in the low demand quarter, Q2’16, was just INR 0.10 per ASK, resulting in a operating profit of INR 109 crores. Below are certain interesting figures. IndiGo will be adding three older used Airbus A320 aircraft to its existing fleet of 101 aircraft, taking the fleet size upto 104. The airline was to have ended the Q4 quarter (ending 31st March 2016) with 111 aircraft, a number that it may not be able to achieve in light of the delays caused to the Airbus A320 neo aircraft. IndiGo’s Airbus A320 neos are powered by the Pratt and Whitney geared turbofan (GTF) engines, which have a technical issue that will impact the airline’s turnaround time and operational efficiency. If the issues with the engines are resolved and the neos are delivered by February end, the airline may end Q4’16 with perhaps 3 – 4 neos, corresponding to a quarter end fleet size of 107 – 108 aircraft. Fleet ramp up, including the older A320 ceos, may happen only in March as the airline prepares for the Q1’17 peak quarter. An analysis of Q3’16 shows that the there is perhaps a looming threat of overcapacity. The growth demand is higher than the natural growth, most of it having resulted from stimulated growth rather than real growth. This may perhaps impact load and seat factors in Q4’16. Fuel prices, if they continue at February’s rates, may result in a fuel price drop of 16% in Q4’16 over Q3’16. If fuel prices drop further by 10% in March (ATF dropped 10% in January 2016 over December 2015 and dropped 12% in February 2016 over January 2016), the quarter drop may touch 19%. In either case, fuel cost per ASK is expected to drop below INR 1.00 per ASK to between INR 0.88 per ASK and INR 0.91 per ASK. Rentals are expected to slightly increase, while cash and non cash incentives are expected to get further diluted. Employee benefit expenses may decrease only slightly, as the ESOPs had cost the airline INR 0.002 per ASK, and the airline seems to be sufficiently staffed, for now, for the airplanes it plans to induct this year and the next. Depreciation and amortisation are expected to remain almost unchanged, while landing and enroute charges may see no significant increase. Other expenses may remain almost unchanged. Together, IndiGo’s operational CASK (Cost per available seat kilometre) may reduce to INR 3.05, a drop of 5% over Q3’15. Unit revenues may be lower than in Q2’16 due to the lower fuel prices allowing airlines to further bring down fares, and competition and advance sales to further lower fares. Inventory management will determine seat and load factors, which are not expected to be very high in the light of the lean season and higher capacity in this lean quarter over the previous lean quarter. Total operational RASK at IndiGo for Q4’16 falling to around INR 3.12 per ASK may not be surprising. This RASK will allow the airline an operational profit of INR 0.07 per ASK. Depending upon the aircraft induction plan, capacity at IndiGo may increase by 5% to 6% in Q4’16. However, the lean season is a good time to send aircraft for heavy maintenance, and this may result in a lower than 5-6% increase in capacity. IndiGo enjoys a strong market share of around 35%. With such a large share, the airline may yield a few additional degrees of pricing power, over other players. One possibility is the airline lowering airfares in light of the reduced fuel prices, to apply significant pressure on the competition. With such an approach, operational profit in Q4’16 may be around or lower than the INR 100 crore mark. If however the airline holds its pricing (an unlikely move), operational profits may very loosely hover around the INR 200 crore mark. The views expressed in this analysis are intended to neither endorse nor fault any process or strategy at IndiGo. This analysis has been performed with publicly available information. The author holds neither any shares nor any interest in any form in IndiGo.